Years ago I dreamed of starting my own food company. 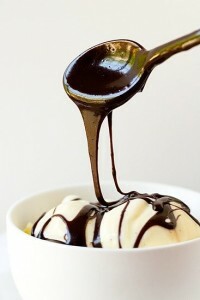 I would create and sell hot fudge sauce. Can you imagine? I attended classes in food manufacturing, creating logos and labels, and other practical aspects of the business. At the same time, I worked feverishly on just the right recipe. At first that was great fun–all that hot fudge sauce to sample, tweak and sample again. My husband and kids enjoyed it too, as did their friends, who willingly tasted and offered feedback. Believe it or not, after six months of daily taste-testing, I all but lost my taste for the stuff. Very sad! Then I discovered writing romance and traded my interest in bottling my hot fudge sauce for my passion in crafting stories. A whole lot less fattening! Within a year or so, my taste for hot fudge sauce returned. I made a batch, of course, and enjoyed every spoonful. My brother tweaked the original recipe and created a winner. If I had started that food business, this hot fudge sauce would’ve been my flagship recipe. In a heavy saucepan, mix milk, sugar, and Karo. Bring to a low boil and let boil 14 minutes. Remove from heat. Beat in unsweetened chocolate until melted; add vanilla. Store in the refrigerator–if there’s any left! Especially good on ice cream or angel food cake. Or just dip in a spoon and indulge. P.S. Makes a fabulous sweet treat for you special Valentine. I am finally coming up for air to say hello. I’ve been working away on the last Saddlers Prairie book and having a wonderful time. I live in Seattle and it’s cold right now. We haven’t had rain in over a week and the city has posted a burn ban. That means no fires! I miss those and hope that we get a good rain or a nice blast of cleansing wind in the near future. Back to work, but I’ll visit again soon. Welcome to my Fun Stuff section! This where I’ll post recipes, fun info about books and characters, and anything else that might be of interest.